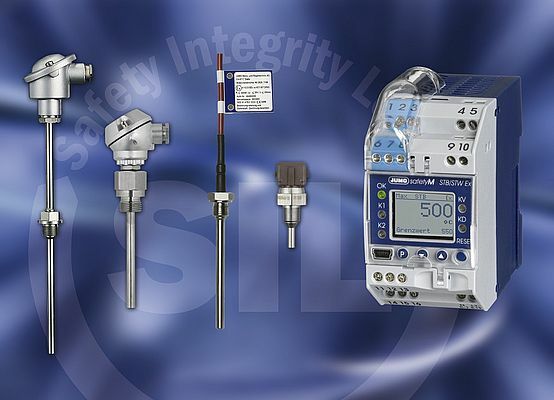 SIL (Safety Integrity Level) is of ever-growing importance in the process industry. For this area, JUMO offers a safety-focused compact solution for various measurands based on the JUMO safetyM series safety monitor/limiter. A certified safety chain for the temperature measurand through SIL3 can be implemented in connection with special JUMO sensors. SIL focuses on the evaluation of the safety chain. This safety chain typically consists of the control, the actuator, and the sensor. In principle, safety-focused variants can be implemented using two approaches. For example, users can use a memory-programmable safety logic controller, but this requires complex programming applications and the inputs as well as outputs are coupled with card types and multichannel features. In addition, each application must be calculated separately and evaluated according to SIL. The use of the JUMO safetyM STB/STW is an alternative to the memory-programmable safety logic controller. A compact single-channel safety control with selectable redundant input signals for standard signals and temperature sensors can be implemented with this safety limiter/monitor. This solution is therefore well-suited for various measurands such as temperature, pressure, or level. The suitability of this solution extends even further to relatively small applications such as special machines as well as individual applications with a low signal density and number of signals. In addition to low investment costs, the advantages here include less parameterization effort for each application. Three different functional outputs are available (analog/binary). In connection with special JUMO temperature probes, the whole SIL safety chain has already been evaluated and corresponding certificates up to SIL3 can be issued by JUMO. To date, no other manufacturer offers this option.